The holiday season is drawing near and we’re sure that the party planners and hosts among you are gearing up for your annual celebrations. While you may already have your game plan sorted for prezzies, food and drinks, have you considered ambience? Having the right atmosphere in your home (or wherever else you may be celebrating) can really help make the day extra special. We’re not just talking about decorations – music is a great way to create a merry mood and thanks to the abundance of affordable streaming services and online music libraries, it’s easier to access than ever before! You won’t have to listen to repeats of that one holiday-themed CD if you’ve got a hearty playlist set up to play in the background throughout the day. If you’re not familiar with music streaming services or you’ve just never made a playlist before, here’s some guides for popular music streaming services Spotify, Apple Music, and Google Play Music. We’ve also included YouTube for those who prefer to have some music videos playing on their TV or PC. Bonus: we’ve also got a list of recommended Christmassy songs from the iiNet Team so you can get a head start creating your playlist! How you can listen: Spotify takes its ‘Listen Everywhere’ tagline very seriously! You can listen through the web player, on the Spotify app for mobile devices (available on iTunes and in the Google Play Store), on your smart TV, on selected game consoles and smart watches, through voice assistants and on several other devices. Spotify is even supported by some cars! 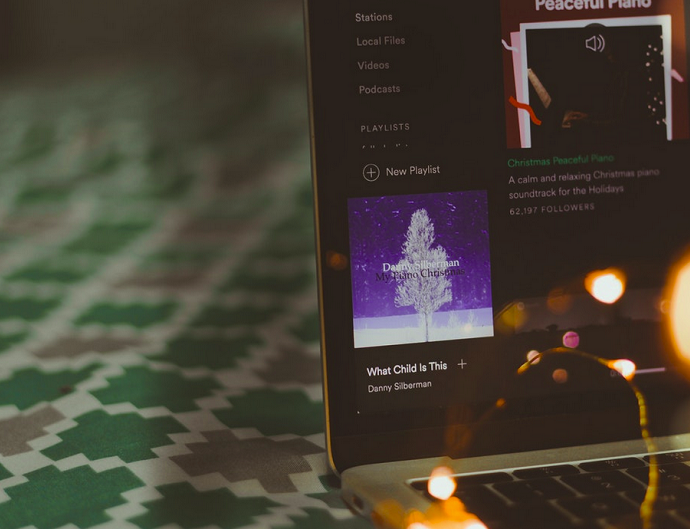 How you can make a playlist: Spotify already has hundreds of playlists you can browse and bookmark to listen to at any time – especially Christmas ones! You can also add songs and albums you find to your own playlist by following this guide. If you want to get your friends and family in on the action, have a go at making a collaborative playlist instead! Other cool features: If you’re a bit stuck for inspiration for songs to include in your playlists, check out Browse > Genres & Moods in the Spotify app and you’ll find some great songs to match the type of ambience you’re trying to create. With a Spotify Premium subscription, you can also download music for offline listening. How much it costs: Spotify Free is available with limited features and intermittent advertisements. You can unlock an ad-free experience with all the features by getting a Spotify Premium subscription for $11.99 a month. How you can listen: The service may be provided by Apple, but it’s not limited to Apple devices. Content is accessed via iTunes, which can be installed on any Mac or Windows PC. This app is installed by default on iOS devices and Android users can download it from Google Play Store. How you can make a playlist: It’s pretty easy to create and share playlists in Apple Music. The share feature even lets you share playlists with your friends! Other cool features: If you’re planning a little bit of karaoke on the big day, the lyrics feature in Apple Music can really help you out. How much it costs: While you may be eligible for a free trial, there’s no free version of Apple Music. You’ll need to subscribe for $11.99 a month. How you can listen: Google Play Music has a handy web player that you can access using any web browser, and it’s also available as an app on both iTunes and the Google Play Store. If you have a Chromecast, you can also cast Google Play Music to your smart TV from your smartphone, tablet or PC. Android TV devices may have the Google Play Music app already installed and ready to go. How you can make a playlist: You can search for existing playlists to see if anything takes your fancy, but it’s easy to add songs or albums to your own playlist – you can even choose to make playlists private or public so others can have a listen, too. Other cool features: Google is the parent company of YouTube, so they’ve arranged some extra perks for premium subscribers. In addition to the Google Play music library, you can also access YouTube Music with no ads, including music videos. Not to mention a subscription allows you to download music for offline listening. How much it costs: You can listen for free (with advertisements) or pick up a Google Play Music subscription for $11.99 a month. How you can listen: You can watch and listen to YouTube in your web browser or on the YouTube app (available on iTunes or the Google Play Store). Most smart TV devices also have a YouTube app built-in for easy access. How you can make a playlist: You can create and manage playlists by following this guide. If you’re worried about your playlist running out, you could consider turning on the Autoplay feature. Once the playlist is done, instead of repeating all over again, related videos will just start playing automatically. Theoretically, this could keep the Christmas cheer rolling but it depends on your viewing history, so there’s a chance that things could get off track. Other cool features: Many YouTube videos have closed captions automatically generated based on the audio – all you have to do is turn them on. This could be useful for a sing-along! How much it costs: YouTube is free to access, however advertisements will play before videos. You can skip the ads by grabbing a YouTube Premium subscription for $14.99 a month. The best part about learning these skills is that you can use them any time, not just for the Christmas season. Have a go and soon you’ll be setting up tunes for New Year’s Eve, birthday parties, barbecues and any other special holidays you celebrate throughout the year. Happy listening! What’s your favourite tune to have on your playlist during the silly season? Tell us in the comments so we can add it, too!